Counterweight 50 tonnes, consisting of various sections (within 3,00 m vehicle width). Hydraulic removal system. • Boom extension 26/34 m, consisting of bi-fold swingaway and 2 boomextensions. 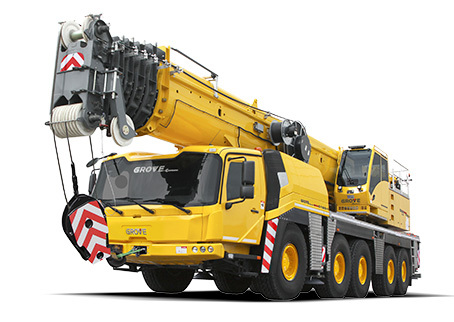 • 3.6 m side stowed 3 sheave integrated heavy duty jib (43 tonnes maxcapacity) hydraulically offset 0° - 40°. Cab Composite designed aluminium and fibre reinforced plastic, 2-mandesign, safety glass, driver seat with pneumatic suspension, enginedependent hot water heater. Complete instrumentation and driving controls. Air condition. 12 V plug. Two rotating beacons. Fire extinguisher.